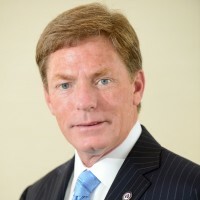 Kenneth Fisher is a senior partner at Fisher Brothers, based in New York City, and is part of the third generation of leadership, overseeing the leasing, management and marketing of more than five million square feet of class-A commercial space in Midtown Manhattan covering the Park, 6th and 3rd Avenue corridors and 1.5 million square feet in Washington, D.C.
Ken is a member of the executive committees of New York’s Board of Governors of the Real Estate Board of New York (REBNY), as well as the Washington, D.C. based Real Estate Round Table. He also serves as a member of the Board of Directors of Strategic Hotels and Resorts, a publicly traded REIT. Ken is a member of the executive committee of City Investment Fund, a $770 million multi-year plan established in 1996 to mobilize the city’s financial and business leaders to help build a stronger and more diversified local economy. As a philanthropist, Ken is Chairman and CEO of the Fisher House Foundation, a not-for-profit organization that constructs “comfort homes” for families of hospitalized military personnel and veterans. Founded in 1990 by his late uncle Zachary Fisher, the program has built 63 houses to date in the United States and Germany, and partnered with the Queen Elizabeth Hospital Birmingham and Help for Heroes to open a Fisher House for British Families in the United Kingdom. Fisher Houses serve more than 22,000 families each year and have saved more than $200 million in lodging and travel costs since inception. The foundation also administers the Hero Miles program, allowing frequent flyers to donate their unused airline miles to provide free tickets to military families, and the Hotel for Heroes program. Ken also serves as co-chairman of the Intrepid Sea, Air & Space Museum in New York City, which welcomes nearly 1 million visitors every year. The Intrepid Museum is home to more than 30 military aircraft, the nuclear submarine Growler, and the NASA Space Shuttle Enterprise. He sits on the board of directors of the New York’s Finest Foundation and the Jackie Robinson Foundation and the General Command and Staff College in Ft. Leavenworth, Kansas, as well as a trustee of the AHRC New York City. For his philanthropic endeavors and humanitarian efforts, Ken has been named an honorary Army Green Beret (2004) and an Honorary Marine (2011). He has been twice awarded the Army distinguished Service medal as well as the Department of Defense Distinguished Service Medal, the second with Bronze Palm, presented for exceptionally distinguished performance of duty contributing to national security or defense of the United States, and is the nation’s highest non-combat related military award and highest joint service decoration. He has also received the Highest Civilian Honor awarded by the Department of Veterans Affairs, The Secretary’s Award. In 2007, Ken was appointed by George W. Bush the President’s Commission on Care for America’s Returning Wounded Warriors, which conducted a comprehensive review of the care provided to soldiers who return from the battlefield. Later that year, he joined the ranks of an elite few to be named one of America’s Best Leaders by US News & World Report and Harvard University. Ken has also received George C. Marshall Medal, The Association of the United States Army Highest Civilian Award. Among other honors, he received the Public Awareness award from the Paralyzed Veterans of America, and is a member of the Order of Military Medical Merit. He has also received the Arts & Entertainment television network’s prestigious “Lives That Make a Difference” Award. This January Ken gained recognition by his industry peers, receiving The Real Estate Board of New York’s prestigious Harry B. Helmsley Distinguished New Yorker Award celebrating a lifetime of exceptional achievement in the real estate industry and civic welfare. “Few Americans have done more for our military and veterans than Ken Fisher. He and his family are the standard-bearers for veterans support in our country. He is world-renowned for this incredible patriotism and a passionate dedication to our veterans. We are honored and humbled to have Ken join the IAVA board,” said IAVA Founder and CEO Paul Rieckhoff.